Students with disabilities including but not limited to: Global Developmental Delay, Autism, Down’s Syndrome, mild learning disabilities and severe learning disabilities. Camp runs for a week during the school summer holidays from Sunday to Friday. We can pick students up by minibus from selected pick up points in the London area and drop them back at the end of the week. Alternatively they can be dropped off at the centre by parents/carers. A structured week of fun includes day trips to the seaside and the zoo and 3 days on-site with outdoor games, swimming, low ropes, karaoke, dressing up, arts and crafts. The week draws to a close with a BBQ evening, camp fire songs and an awards ceremony. During their week long holiday with us they will experience the freedom of beautiful countryside, and the thrill of fairground rides at the seaside. 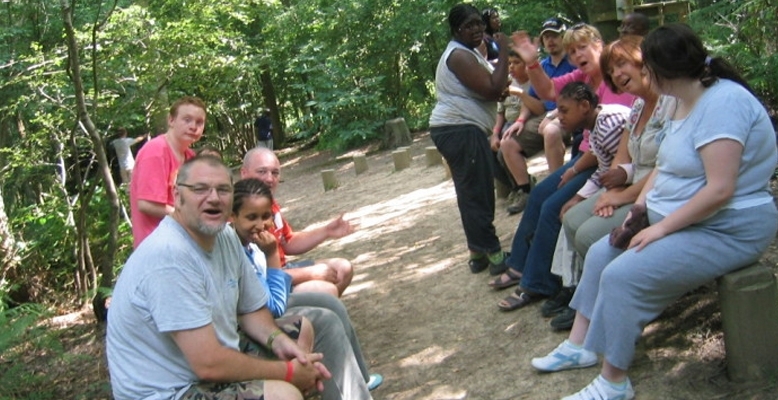 Camp is currently held at Carroty Wood, a St Barnabas Trust Adventure Centre in Tonbridge, Kent. The centre is located in wonderful woodland with large open play areas and an on site swimming pool. Accommodation is in the form of shared rooms of no more than 4 campers per room. The accommodation is equipped with walk in showers. How will Camp Cando know how to look after my child? We will visit you at home before offering a place and will go through a detailed form with you which covers everything from medical, food requirements and allergies, to fears, night time routines and behaviour plans. We can also obtain behaviour plans from schools as supporting documentation. Helpers are briefed on each camper’s special needs and routines at the beginning of the week, with mid-week briefing sessions where new information is shared. Each night we have 4 carers on shift. We have a minimum 1:1 ratio of helpers to campers and a wealth of experience amongst our team. We appreciate that you will have a lot of questions about who we are, and how we ensure your son/daughter will be happy and safe whilst in our care please contact us.